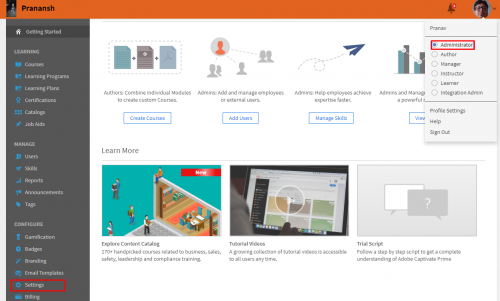 Adobe Connect may be used in the Adobe captivate Prime LMS to create a variety of training content.This article will help you integrate Adobe Connect with the Adobe Captivate Prime LMS. Creating content for training programs within Adobe Captivate Prime requires a suitable tool. Adobe Connect is the default tool that Adobe Captivate Prime is paired with to create a variety of training content. Adobe Connect’s capabilities range from general presentations, and training videos, to providing web conferencing, and user desktop sharing in live training sessions. This article shows you how to configure Adobe Connect with the Adobe Captivate Prime LMS so that you can create training material for learner consumption. Log in as Administrator and click on ‘Settings’. Click on ‘Adobe Connect’ then click on ‘Configure now’. Connect Admin Login ID (only required if you do not use your email address to login). Fill in these details and then click on ‘Integrate’. The integration must be verified and approved by the Adobe Captivate Prime team, which may take up to 48 hrs. Once approved, you will receive a notification email, and you can check the status by re-visiting the page above. Once Adobe Connect has been successfully integrated, you can create and view content in Adobe Captivate Prime, using Adobe Connect. Additionally, the conferencing and screen-sharing aspect allows learners to participate in live virtual classroom sessions, across time zones and geographies. For further information, please visit the Adobe Helpx section on Adobe Connect integration. If you require assistance, please do contact captivateprimesupport@adobe.com.